On Tuesday, September 23rd, an underage male visited the San Pedro Police Station at around 5:01PM to make a report against a police officer. According to the minor, on Monday, September 22nd between 2AM and 6AM his mother, Mirna Judith Berganza was detained for a traffic offense. As a result the minor and a family friend, Saul Chavez, went to the station to see what was happening. 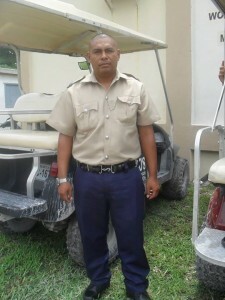 At the station Chavez spoke to Police Constable #1139 Oscar Ramirez who demanded $300BZ for the release Berganza. According to Chavez, PC Ramirez arranged that the money be given to him at the round-about on Pescador Drive. At about 5PM on the same date, PC Ramirez caught up with the minor and Chavez again while leaving the DFC Area. PC Ramirez proceeded to demand an additional $700BZ. They informed PC Ramirez that they did not have the money and only had $300BZ. PC Ramirez agreed to take the $300 which was given to him. A total of $600BZ was given to PC Ramirez for the release of Berganza. ON Tuesday, September 30th at about 5PM a group identification parade was conducted where 36-year-old PC Oscar Ramirez was identified. PC Ramirez was formally arrested and charged for the crime of “Extortion”. 22-year-old Eleterio Hilberto Cantun has made an official police report in connection to an incident that occurred on Sunday, September 7th at 7:30PM. The initial report by witnesses stated that Cantun left a bar on Laguna Drive clearly intoxicated and was followed out by three other persons who proceeded to gravely beat him up. Cantun reported to the police that he was out socializing with his friend Kevin Pech at the bar. He left at around 11PM walking in a northern direction towards Sir Barry Bowen Bridge. While walking, Cantun felt something hit him on the back of the head and went unconscious. Witnesses stated that Cantun was beaten repeatedly and violently. The victim was found in critical condition and was airlifted to Belize City to receive treatment at Karl Huesner Memorial Hospital (KHMH). Cantun was in a coma from two days at the KHMH. He did not recall the incident. He sustained cut wounds to the right and left side of the head, bruises on the stomach, swollen left eye and cut over right eye. Cantun also reported that during the incident his cellular phone valued at $50BZ, wrist watch valued at $100BZ, and wallet containing $150BZ cash and personal documents were stolen. The incident is under investigation as police have suspects for the attack.